← Lee Gregory – The Next Non-League Star To Turn Pro? Lowestoft Town made the 340 mile round trip to Hampton and left with all three points thanks to a dramatic first half which saw two goals and two red cards. The visitors are one of the in form teams on their travels in the division, while Hampton had won three on the bounce for only the second time this season. The Trawlerboys took the lead in the sixth minute out of nothing. A long ball led to a bit of confusion in the Hampton defence, as goalkeeper Rodney Chiweshe came a long way off his line to clear. However, Stuart Lake took the matter upon himself, clearing the ball out towards the left. Unfortunately, the clearance landed at the feet of winger Robert Eagle, and he had all the time in the world to control the ball and sidefoot a volley back into the unguarded net from fully twenty five yards. Hampton’s first chance came on the quarter hour; Charlie Moone looped a lovely volley over the defence into the path of strike partner Dave Tarpey. The in form frontman didn’t even need to control the pass, instead hitting a first time shot which Lowestoft goalkeeper Ashlee Jones saved smartly down low to his right. Tarpey’s next action was to stupidly get himself sent off. As he broke into the box, a strong but firm challenge from a defender put him on the floor. As Tarpey got back to his feet, he clearly stamped on the prone defender (I think it was Dan Gleeson, however a melee broke out so quickly it obscured my view). The defender then angrily got to his feet and violently shoved Tarpey, causiong said mass fracas. Although the referee had seemed to be looking straight on at the incident, he still opted to go across to speak to his assistant. We all assumed the red card for Tarpey was inevitable, and that the consultation between the officials would be regarding the punishment for the retaliation. Indeed, Tarpey was given his marching orders, yet incredibly the defender got off scot-free, much to the home fans’ consternation. Lowestoft looked comfortable with the man advantage, but didn’t create anything in terms of clear cut opportunities. Michael Frew and Dan Gleeson both had long range efforts easily saved by Chiweshe. However, on the stoke of half time the game got away from Hampton. Charlie Moone had an effort cleared off the line before Lowestoft doubled their lead. Chris Henderson met a corner with an unmarked glancing header to put daylight between the sides. Things got worse in stoppage time, as Charlie Moone reacted angrily to a foul given against him. The referee had no choice but to dismiss Moone for foul and abusive language. Hampton made a change at half time, bringing on striker Ben Harris to replace Jack Barton, so that at least they had one frontman on the pitch! The first chance of the half fell to Jake Reed, but his right foot drive was parried well by Chiweshe. Twenty minutes into the half, and the deficit was halved with probably Hampton’s goal of the season. Right back Tommy Brewer lined up a freekick just inside his own half, and spotting Ashlee Jones off his line, he launched an almighty shot that sailed over the ‘keeper’s head and into the top corner. It was an incredible strike, and probably deservedly got The Beavers back into the match. Despite plenty of counter attacking possession, Hampton just couldn’t create an equalising opportunity, and on more than one occasion were thankful for goalkeeper Chiweshe. He brilliantly repelled Reed’s header, before rushing off his line to deny Eagle. Lowestoft were presented with a golden opportunity to seal the victory two minutes from time, when James Simmonds brought down Eagle for a nailed on penalty. Up stepped Jake Reed, but his spot kick was brilliantly saved by Chiweshe, who then got up quickly to deny Eagle from the rebound. It was a fantastic double save, the kind that all goalkeepers must dream about. At the other end, Ashlee Jones had a bit of a nightmare when he scuffed a clearance straight to Ben Harris. The pair clashed on the left, with Jones hauling down the striker outside the box. 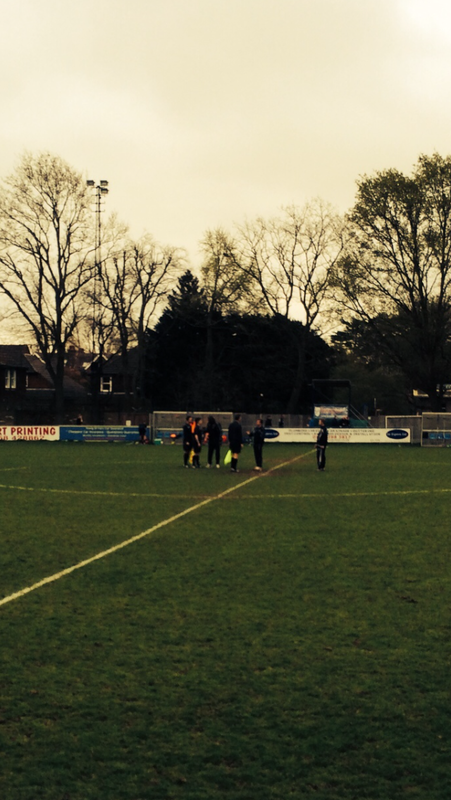 The ‘keeper was booked for the challenge, with the home faithful baying for a red card. From the freekick, Harris headed narrowly over. The final chance came for the visitors. Chris Henderson lashed a powerful effort towards the top corner, but Chiweshe brilliantly tipped the effort over to seal his man of the match award. Sent off: Tarpey, Moone (Hampton). Man of the match: Rodney Chiweshe (Hampton). 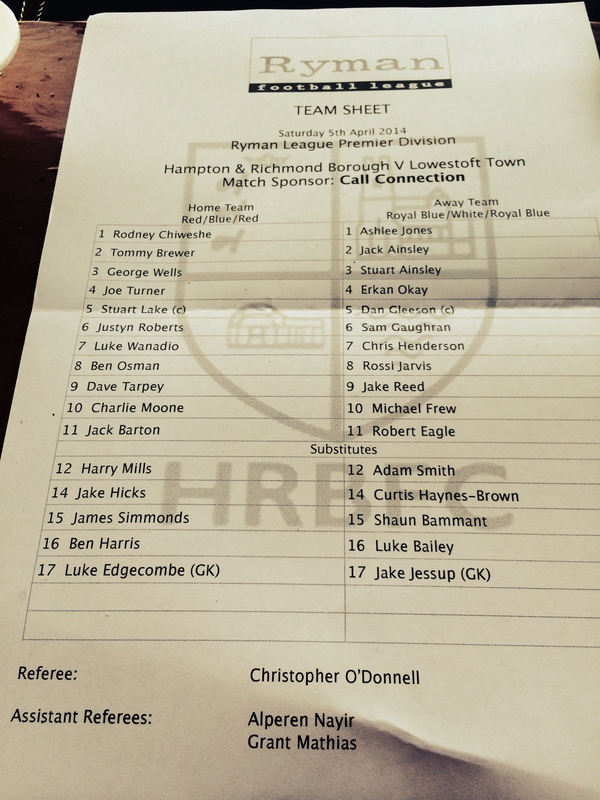 Posted on April 6, 2014, in UTL Archive and tagged Charlie Moone, Dave Tarpey, Hampton & Richmond Borough, Lowestoft Town FC, Ryman Premier. Bookmark the permalink. Leave a comment.